Cleaning marble tile is not that hard and you shouldn't be afraid of marble cleaning because it's marble. I constantly hear people say or read on the internet how delicate marble surfaces are. Yes, they are higher maintanence than a ceramic tile, but they are not that delicate or hard to clean. As long as you know what to clean them with, and you clean them regularly, they should stay looking great for years to come. 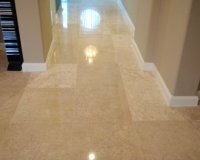 In general, mopping marble tile floors regularly with a neutral floor cleaner and a flat mop, will be the best and easiest way to maintain your marble floors. 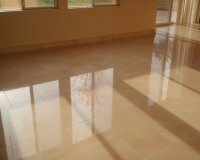 Neutral cleaners for natural stone are recommended and available here and if you don't have a neatral cleaner, use warm water to clean you marble surface. When it comes to cleaning marble or just maintaining natural stone and tile and grout, we strive to help educate our customers on the best protection they can have, helping them save time and money in costly restoration costs down the road.